I am really grateful for this three day weekend (happy birthday, George Washington & Abe Lincoln), because it was a week. I was trapped on the train two days in a row, and resorted to tweeted at NJ Transit to try and find out why my 35 minute train ride turned into 1 hour +, and then there was weather on top of the delays. And, the weather came while I was at work, snow and then rain and ice, which made a mess, and I had not boots, and --sigh--, like I said, it's been a week. It cut into my blog hopping time, but I should be catching up with everyone this weekend. And -- 3 DAY WEEKEND! I got my haircut yesterday, thank goodness. I have really fine, straight hair, and it's a hot mess, when it gets too long. I just don't have the patience to work with it either. I am always in this honeymoon stage with my hair following a haircut. I keep trying to get exactly what I want. I actually show my stylist pictures of myself with haircuts I have already had, but I just can't seem to recreate the magic, but it is an improvement from my overgrown hair. I was overwhelmed by publisher love this week, and it was especially timely, that I received approvals for so many of my anticipated romances. 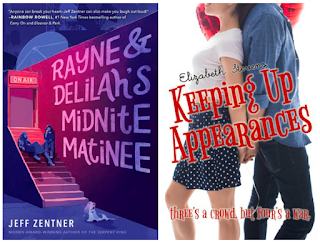 No 5-star reads this week, but two came so close. Both Fierce Fragile Hearts and On Thin Ice were fabulous, but there were small issues I had, which kept them just a hair under that full 5-stars. I was surprised by a few books too. Reviews had been all over the place for Dead Queens, but I have to say, I enjoyed it. There were times I felt a little lost in the plot, but maybe I wouldn't have been, had I read instead of listened to the book. Not sure. One of the best surprises for me this week was a late approval for the new Zentner book. I adored his first two books, and had given up getting the galley, when BOOM! There it was. This one is more fun, less sadness than the previous two books. I am in love with the friendship between Josie and Delia, and keep delighting in how Zentner snuck in references to his last two books. Well done! Whoo hoo! My library loan for Two Can Keep a Secret came though, and I am really excited to read it, since McManus' debut was such a hit for me. Yay for 3 day weekends! And sorry it was a tough week- that train stuff sounds awful. Hopefully this week will be better. I hate it when the weather makes just getting around a pain. The Gamer's Guide To Getting The Girl looks cute. And Two Can Keep A Secret *nods* I really need to get to that one too. I don't drive so I've always had the stress of relying on public transport to get to work and I hated it, especially in winter! I do drive, but I hate to drive, and will only drive to work on a have-to basis. It was just two bad days in a row and weather, which sort of beat me down, but I would like to think next week will be better. Ugh to NJ Transit. I hated having to take it when I worked. Recreating great haircuts is almost impossible. I feel like I never was able to even with pictures. So many great books!! I got Rayne and The Lemon Sisters too and waiting on The Wedding Party. I hadn't seen Again but Better for review so I am off to check that out. Hope you have a great week! My hair is ok. My stylist had an emergency and I let someone else cut it, and well, she wasn't my stylist, but hair grows back. I LOVED Rayne. Both Rayne and Lemon were books I had given up on, so YEAH! Sigh...I miss having President's Day off! The company that bought us out took that holiday away from us. If I don't go into work, I don't get paid, but working is optional. I'd rather not lose out on that pay even if there won't be anything to do. Just hoping I get in there in time while people are still there! Lol! Sorry to hear your week was crummy, hope that the three day weekend provides a nice needed break and that this week won't be too terrible! Nice new reads! All totally new to me ones as usual, it would seem! Lol! Still hope you will enjoy each and every one of them! We 99% of the time close with the stock market, so, thank you federal holidays. I am actually not a huge fan the 3-day weekend, unless I have plans, but this one is welcomed due to the the circumstances of last week. Yay for a three-day weekend. I really wish I had one too, lol. We've got more winter weather in our forecast this week and I'm already dreading it and hoping the forecast changes. I got a late approval for Rayne and Delilah's Midnite Matinee too and can't wait to read it! Also, a big yay for Two Can Keep a Secret. I loved her first book too so I'll be looking forward to hearing your thoughts on this one. You have have had so much more snow than NJ. I saw something in the forecast for Monday, but I hope the weatherman is wrong, as he has been for every other storm. It was raining Rayne & Delilah approvals it seems. Yeah for us, because it was great. The Austin Playbook sounds interesting! Play to Win (I love hockey romances) and The Takeover Effect are also on my list of books to read. Fingers crossed this week's commuting is much better for you! Lucy Parker's series is SO GOOD. If any of the books go on sale or you can get them at your library, you should. They are wonderful! I was excited to see Play to Win on NG. I enjoyed Jamieson's Aces series and am looking forward to meeting her new "team". Enjoy your 3 day weekend! My hair is fine and straight, too. Mostly, I just let it hang and do nothing with it. I’m glad you liked the new Zentner book. I’m excited to read that one. I used to keep the hair long, but the older I get, the less patience I have for it. I keep it short and easy. I loved Zentner's book. The last few chapters made me so, so happy. I am still recovering from last weeks awful snow and ice storms we had here and the rain that followed and then "flash froze" the snow in ruts on our driveway. We put sand down for traction cause the temps are unforgiving. Yes to three day weekends to recover and read too. The weather has been much worse south and west of me. We have been lucky this winter, but you know March is a wildcard. NJ could be saving all the misery for me. Hang in there. The end of winter is coming. I feel like we've been overdue for this 3day weekend (4 for me because I had a comp day on Friday). Sorry transit has been such a mess lately, but yay publisher love! Two Can Keep a Secret is soo good! Nice 4-day weekend. I hope you have something fun to do or use it to recharge. I am about 35% through Two Can Keep a Secret and I'm a fan. I did get home with no problems on Thursday and Friday, but yeah, not a fan of being stranded on the tracks. I only drive if the train is canceled, which has not happened in a while and doesn't happen often. My drive would be 40 miles each way in bumper to bumper traffic. I just don't have the fortitude to do that. It seems that the pub did a lot of late approvals for Rayne & Delilah, and I am so glad I made the cut, because it was wonderful. The Quiet You Carry was kind of sad, but I mean it couldn't avoid it due to the topic. I didn't realize the author was writing about the foster care system from first hand experience, which made it more meaningful for me too. Yay for three day weekends! I wish I had one :( Omg, you were approved for so many good books this week! I just got approved for Waiting for Tom Hanks and Im super excited to get to it, and I'm not so patiently waiting to hear about The Wedding Party. Good luck with your reading next week! I have been having really good luck with my romance requests. YA, not so much. Tom Hanks was a must for me. I loved Winfrey's YA book and am excited to see what she brings to adult contemporary. Ugh on the train delays, but woohoo for the 3-day weekend. Hair! yeah, its tough to have a perfect hair day (or hour or minute). Oh, you did get a delicious haul this week. I'm curious about the Tom Hanks books. I read a Searching for Jamie Fraser one a few years back that was cute. Have a great week, Sam! My hair will start out great, but as soon as I start walking to the bus stop and the train blowing past me on the platform, it can become a hot mess. Searching for Jamie Fraser? Oooh. I love Jamie. Yes, I'm so excited for the three-day weekend, too! But you know that that means? Tuesday will be the Monday-ist Tuesday. How I wish this was a 3 day weekend for me! Off to work I go tomorrow though. Sorry about all the trouble you had this week. I am so ready for winter to just go away. I hope you have a great week and enjoy all of those new books! We have been lucky this winter, but March always seems to surprise us (and not in a good way). Trapped on a train sounds like a nightmare!! But yay for 3 day weekends! I need to get my hair cut SO BAD. I have super curly hair, so I can let it go longer between cuts, but its getting long now and I'm irritated with it. My sister, mom, and dad all have wavy hair, and don't deal with the limpness that I do. I am super cheap, so I want my haircut to last 3 months, but it never really does. My hair is really fine and thin too. I can never find a style that suits me---I like it shorter, but my husband likes it longer and I'm lazy anyway, so I usually end up letting it grow out. And I don't have a stylist I like so I go to random people. Definitely need to get it cut again soon. My whole family has been going to this salon since 2001, and I have never gotten a bad haircut there. I ended up going to a different stylist, because mine had an emergency, and the cut is still good. My hair is my hair. There is only so much they can do with it. Hurray for long weekends and new haircuts! I've seen a lot of people talking about Again, But Better. I hope you enjoy it! The Quiet You Carry looks really interesting too. I'll have to check that one out! I hope you enjoy Two Can Keep a Secret! That's one I've had my eye on. I have been interested in Again, But Better since Christina Lauren talked about it. I have been loving their books and am trusting their judgement there. Two Can Keep a Secret was great. It had all those elements I enjoyed in McManus' previous book, and she saved the most shocking reveal for the very last line. I would rather be stuck on a train than a plane any day. I abhor air travel, though it is quite the timesaver, when it is running according to schedule. All the other WLABBers were huge Christine fans. I even have a picture of them with her in a parking garage during a BookCon weekend. CLo talked about the book, and pretty much sold me on it, so I was excited to get the approval. Hair is complicated. I wish I had a face that could support a pixie cut, but then, I am not sure I could afford the upkeep. There is supposed to be weather again today, and it's most frustrating when it starts while I am working. You know, everything seems fine and then BOOM! Delays and accidents everywhere and I am stuck 40 miles from home. I hate the upkeep, but my hair looks a lot better short. I try to get 3 months out of my cut, but it is usually horrible towards the end. As far as I'm concerned, Zentner did it again. Loved Rayne & Delilah! I really want to read Two Can Keep a Secret by Karen McManus - my daughter too. I still have a gc to BAM and my daughter has one to B&N so we need to book shop soon. I was so excited when my eLibrary got it. I devoured it. I am a fan of McManus' storytelling, and she had little reveals up to the very last line of the book. Jasmine Guillory seems to write fairly quickly!! Or maybe it's just me not being caught up but seeing her book covers all over. I really want to start that Kelly Jaimeson series but need to get my hands on book one first. Great post!! Do you have access to Hoopla through your public library? I was able to get the audiobooks for the Aces series for the ones I hadn't read via eARCs.